The dilapidated appearance of the hotel’s exterior belies the wondrous and modern comforts inside. Upon exiting the wonderfully inexpensive taxi I had taken from the airport, I looked up at the 10-story building and gulped. 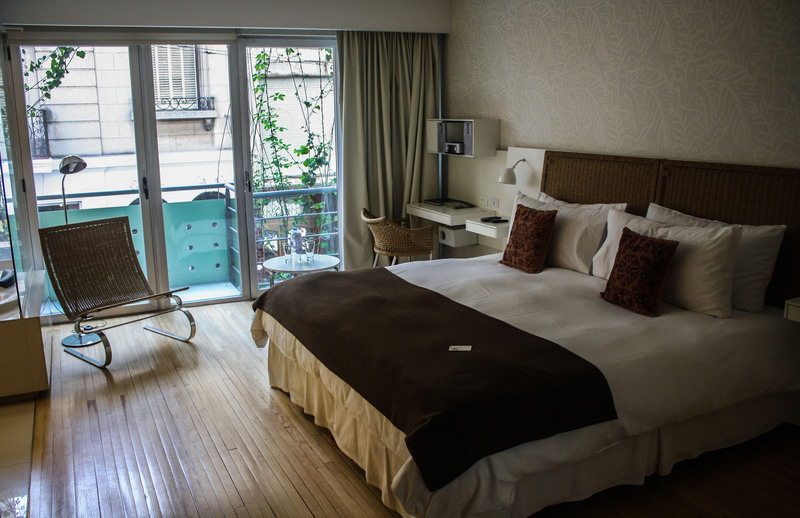 The rates I had already prepaid for the Casa Calma Wellness Hotel in Buenos Aires were high, but I had wanted to indulge a bit for my final two nights in Argentina after a two-week run around the northern half of the country. As I stared at this eyesore, I imagined some sort of catastrophic mistake had been made. The hotel looked like a wreck straight out of Ukraine, 25 years after the Chernobyl meltdown. Narrow and with industrial-looking privacy screens on the balconies, the front of the building — all glass windows and doors — was draped with wild-looking vegetation that cascaded from one floor down to the next, as if nature was reclaiming an abandoned building in, say, Pripyat or Detroit. As I stepped through the front door, however, everything changed — immediately and drastically. The small lobby, bright and perfectly ordered, with green glassware, vases, and knickknacks on the bookshelves behind the comfortable wicker chairs, could not have been a more unexpected contrast to the exterior. A staff of young, friendly, professional women checked me in and directed me to the little elevator that carried me to my room on the second floor. The hotel has only 18 rooms, two per floor (one in the front and one in the back), practically ensuring quiet and the calma promised by the hotel’s name. And as soon as I opened the door to my room, my initial impression immediately disappeared and I became ecstatic at the prospect of staying here for the next 48 hours. An exceptionally comfortable bed and private balcony are just two of the things you’ll love about your room. Opened in 2008 as the first zero-contamination hotel in Argentina, it remains one of the few truly eco-friendly hotels in the country and seamlessly combines environmental awareness and blissful comfort. From its construction to its daily operations, Casa Calma has embraced a green mindset. 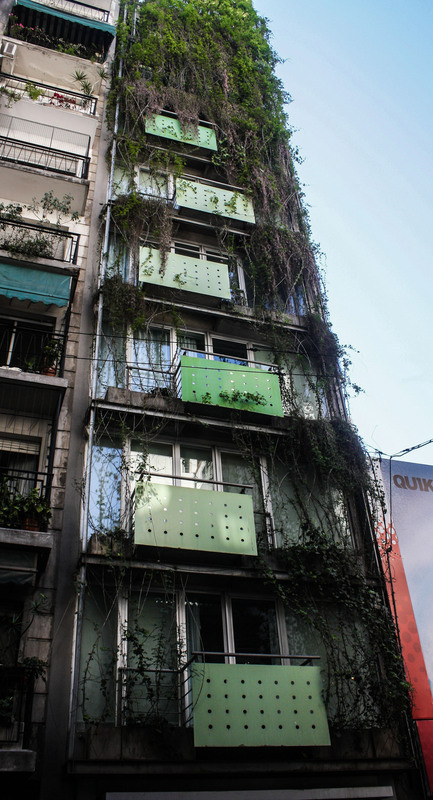 Double-glazed windows keep out the noise as well as the heat and cold in summer and winter, aided by the vertical garden flowing down around the sides of my balcony, which also creates a sense of a private oasis far from the busy urban environment right outside the door. All of the wood used for the floors and furniture is Carolina pine, certified by the Forest Stewardship Council, and the wallpaper is made out of synthetic fiber fabric. In addition to its recycling and towel-reuse programs, Casa Calma issues guests room cardkeys that also activate electricity, ensuring reduced energy consumption; donates used cooking oil to local authorities to be reused in fuel production; and has installed bulk dispensers in the bathrooms for shampoo and soap, dramatically decreasing packaging waste. With a clear focus on long-term sustainability, Casa Calma doesn’t skimp on the short-term pampering of its guests either, and it’s this harmonious blend of doing the right thing and doing things right that make this hotel so memorable. 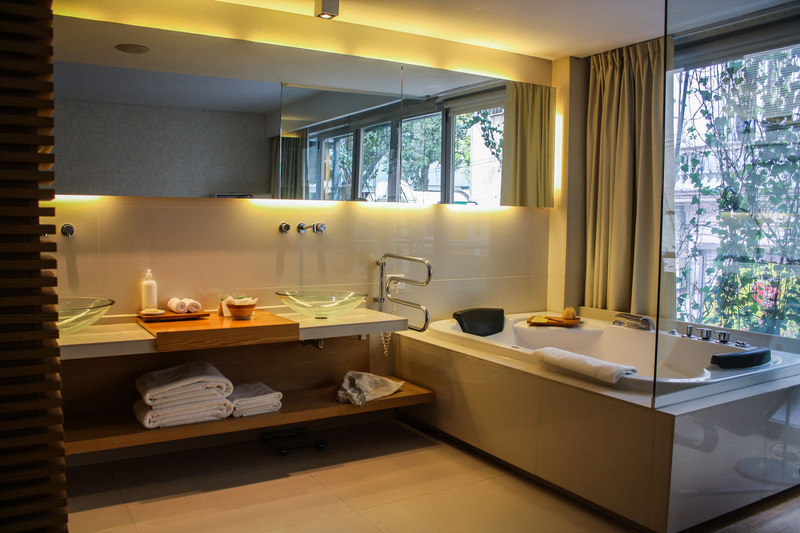 The Jacuzzi in your room contributes to the calm and wellness promised by the hotel’s name. Every morning, you’ll find a news brief in your native language slipped under your door — a quick overview of the top stories from around the world, easily digested over a continental breakfast in the small breakfast room past the lobby. After a full day of touring, tasting, and tangoing your way around Argentina’s capital, you’ll return to your generously sized room and the soft colors of its décor that exude warmth and tranquility. Everything will have been restored to its pristine condition, and the daily turndown service will have already been executed, including chocolates on your pillow and a weather card for the following day placed on the mattress of your king-sized bed. The bed faces the open area of the bathroom, with its double vessel sinks and inviting Jacuzzi; the more private part of the bathroom, to the left, includes a sauna, so you basically have your own spa. Once you’ve soaked, steamed, and scrubbed, and poured yourself into the provided slippers and thick robe, the LCD television, DVD collection, and CD player will keep you entertained for the rest of the night. After only two nights here, the calma and the wellness had completely overtaken me, and I left Buenos Aires more refreshed than when I first arrived two weeks earlier.